Kamaladevi was a woman who wore many hats. She was the freedom fighter who went to prison for civil disobedience. She was the internationalist who forged friendships with feminists like the American Mary van Kleeck and the Egyptian Huda Sha'arawi. She was the diplomat who outmaneuvered superpowers to make the right to self-determination a human rights issue at the United Nations. She was the “colored woman” who refused to budge from the whites-only section of a segregated train in the American South. And, as many Indians do remember, she was the proponent of tribal and village handicrafts in independent India, establishing institutions like the Central Cottage Industries Emporia. One suspects that by then, she was concerned not with colonial or fascist powers, but the modern state itself. Post-independence, Indian economic policies have, more or less, aimed to catch up with industrialized economies. Tribal populations are generally seen as rebels against this model of development. 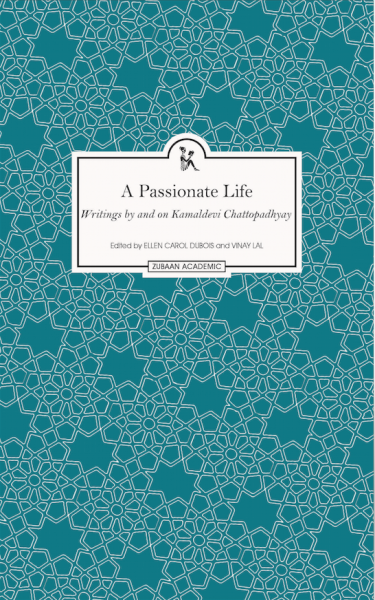 Given Kamaladevi’s multi-faceted life, it works in the book’s favor that its two editors, Ellen Carol Dubois and Vinay Lal, both UCLA professors of history, come from different backgrounds and perspectives. Dubois, a historian of American feminism, reflects on the question that will puzzle many: why did Kamaladevi not self-identify as a feminist? Dubois suggests that, among other reasons, her distaste for the feminist moniker may have to do with feminism’s strong association then with suffragists of the Anglo-American world – imperialist, from Kamaladevi’s perspective. Kamaladevi herself had one son, so one can assume that her personal choices were in step with her political positions. There are other, more telltale, signs. She was a child widow, who did the unthinkable by remarrying under civil law. She did the unthinkable again when she divorced her husband (a brother of the more famous Indian woman of that generation, Sarojini Naidu) after that relationship turned sour. Reading Kamaldevi’s writings one realizes that she saw in India’s freedom struggle an opportunity for women to reclaim the rights she believed they enjoyed in ancient India. “Such social disabilities as purdah and child marriage were entirely unknown’, she wrote in 1929 of the Vedic and Puranic periods. So what would Kamaladevi say about today’s India with its hyper-masculine Hindu identity? The Narendra Modi government’s hallmark is Hindutva, an ideology that smothers cultural and religious diversity and restricts women and minority rights. Kamaladevi, who had expressed dismay that women’s awakening in India did not sustain its momentum after independence, would have been deeply troubled today. But she would neither be silent nor still. The book’s co-editor Vinay Lal, a prolific writer on the political and legal history of colonial India, Hinduism, Gandhian philosophy, and Indian cinema, recalls how four years before her death, Kamaladevi, as “a social worker from Delhi,” petitioned the Supreme Court to secure the release of Sikh women and children who were being held in Punjab’s prisons in 1984. She argued that they were ordinary pilgrims who happened to be visiting the Golden Temple in Amritsar when the Indian army stormed it, in its fight against Sikh separatist militants. She managed to secure their release. Kamaladevi was a resourceful woman who grasped that women’s rights, religious freedoms, environmental justice, political independence, and civil rights were not single-issue movements. Now more than ever, as the space for these movements shrinks in India and elsewhere, we should not let this one be forgotten.